Welcome back to Jewels of Apator, Ann & Jeff VanderMeer's column about the intersection of art and the fantastic. Aaron Jasinski is a great example of the next generation of creators, slipping easily from song writing and production, including game work for clients including Microsoft and Oberon, to art and illustration. In this new era of cross-pollination more and more of the divisions between different types of media, and even different types of influences, are falling away. Whether it's work for shows like "Lost in Space" or his wonderful "Starcatcher" painting, created for a show at the Dorothy Circus Gallery in Rome Italy, his SF art has a kind of charming retro feel. It's the future brought forward from the 1950s, but without a Jetsons vibe-which might just mean that Jasinski buys into the idea of playfulness more than some. I grew up in a musical family. Music tends to be a natural and easy subject for me to include in my visual artist. Beyond subject matter, I think music influences my art in how I try to express the color, rhythm, and pattern in some of my paintings. Music is the most abstract art form, yet most of it is so easily accessible and emotion-relevant to us humans. I'd like to capture that in paint. I love technology and gadgets. I do a lot of music using my computers and other electronic devices. I think this interest does filter into my art but in a sort of juvenile way. I try to use the modern world or even the ‘future' as a source of puns... and humor in case you don't find [the] puns very funny. I would have to Isaac Asimov is probably my favorite science fiction novelist. I especially like his "Robot' novels and how he uses a science fiction background to explore a lot of interesting philosophical ideas about freedom, choice, and what it means to be human.. But for SF art, "It could only be Syd Mead. That guy is a genius from another world. I wish I could draw like him. In his other life as a musician, Jasinski is a member of the Remix Artist Collective (RAC), who "create re-interpretative rock/electronica/dance remixes for musical artists" in a way known for its emotion and playfulness. The RAC has done remixes for bands like The Shins, Robbers on High Street, Block Party, and Tokyo Police Club. None of the four members of RAC, including Jasinski, have ever met each other-another sign of the changing dynamic in the creative world. 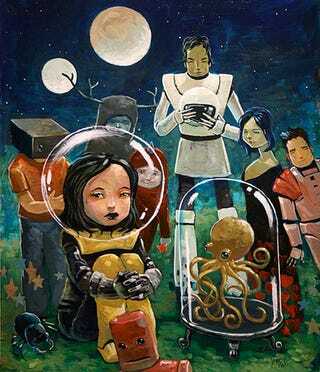 Currently, Jasinski is working on a piece for a Star Wars art book and a solo show coming up in 2009. You can check out his art and his music here on his site. Drool Over Our Alien and Predator Centerfolds, and Win Free Books!